For some Shrove Tuesday is a great excuse to have fun with friends with whilst gorging on a delicious and cheap treat. For others Shrove Tuesday goes by without notice. However, even of those who do celebrate the holiday, many have no idea as to the history of the holiday. So for those of you who simply associate Shrove Tuesday with eating pancakes, keep on reading to become enlightened as to the true meaning of Shrove Tuesday. Shrove Tuesday is the day before Lent – the forty days leading up to Easter when Christians remember the time when Jesus went into the desert to fast and pray before beginning his work for God. During this period, it is traditional for Christians to give something up to show self-discipline in tribute to Jesus’ time fasting in the desert. Shrove Tuesday was traditionally used as a day to use up the last of all the rich foods that Christians would resist throughout Lent. People also used this day to go to church and confess the bad things they had done in which they would be ‘shriven’ or forgiven before the start of Lent. This gives Shrove Tuesday its name as ‘shrove’ means being forgiven for doing wrong things. Well, now you know the history behind Shrove Tuesday and why one day a year pancakes are celebrated like never before. Always nice to have a bit of context! Why not make the most of Shrove Tuesday this year and have a go at making one of these enticing recipes? Whether you’re a sweet-tooth, savoury fan or even allergic to wheat and gluten, you can embrace the pancake with one of these recipes! Chocolate pancakes with fresh berries, are easy to make and are good for breakfast or dessert. For the pancakes:Sift the flour and cocoa into a bowl, add the egg and egg yolk and oil then gradually whisk in the milk until smooth. Leave to stand for 15 minutes. 2. For the filling: Mix the yogurt, custard and chopped mint together. Mix the berries together in a separate bowl. Melt the chocolate if using to decorate, in a bowl set over a small saucepan of gently simmering water. 3. 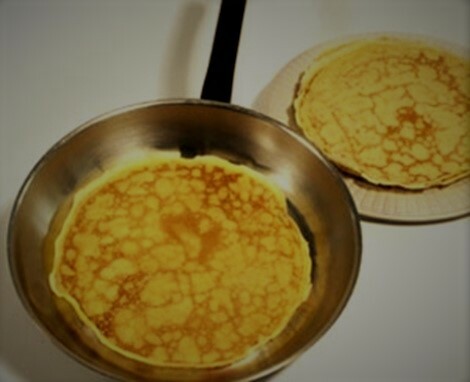 To cook the pancakes, heat a little oil in the base of a frying pan, pour the excess out of the pan into a bowl then add 2-3 tablespoons of the pancake batter to the pan, tilt pan to swirl the batter over the base in a thin layer then cook until browned on the underside. Turn the pancake over and cook the second side then slide out of pan and keep hot on a plate while you cook the remaining mixture until you have 8 pancakes. 4. Fold the pancakes into quarters, spoon in the yogurt mix and berries in to each quarter, arrange in pairs on serving plates and drizzle with melted chocolate, if using. Serve immediately. Cook spinach and mushrooms with onions, cream and butter and serve on freshly-made pancakes for a stress-free supper. For the pancake batter:Melt the butter over a low heat. Put the flour, a pinch of salt, milk, eggs and 2 tablespoons of water into a mixing bowl and beat together with a hand whisk to make a smooth batter. Whisk in the melted butter and leave to rest for 20-30 minutes. 2. For the filling: Melt the butter in a heavy saucepan until it foams. Add the onion, then cover and sweat over a gentle heat for 5-10 minutes, until soft but not coloured. 3. Meanwhile, cook the spinach in a tiny amount of water in a large lidded saucepan for about 3-4 minutes or until the leaves wilt. Drain the spinach, then squeeze out the excess liquid with the back of a spoon. 4. Add the mushrooms to the onion and cook for a few more minutes, then stir in the cream, parsley and spinach. Season with a squeeze of lemon juice, salt and pepper. 5. Cook ladlefuls of the pancake batter into a non-stick frying pan until set on the surface. Turn over to cook the other side. Use to make 4 large or 8 small pancakes. 6. Lay the pancakes on warm plates and spoon the filling in the middle. Serve, sprinkled with chopped chives. 1.Mix together the flour, eggs and milk. Heat a little oil in a heavy frying pan and as it starts to smoke, pour in just enough batter to thinly coat the base of the pan. Cook until golden, then turn the pancake over and cook other side until golden. Stack the cooked pancakes on a plate and, if you’re not eating them straightaway, cover with cling film or foil to stop them from drying out.